Ten Speed Press, 9781607749424, 352pp. Danielle Walker is the beloved author of three New York Times best-selling cookbooks—Against All Grain, Meals Made Simple, and Celebrations—and the voice behind one of the most popular grain-free blogs on the Internet, againstallgrain.com. After being diagnosed with an autoimmune disease and suffering for many years, Danielle found health through dietary changes. She has become a beacon of hope in the autoimmune world, and has been a leader in the Paleo and gluten-free movement for nearly ten years. Danielle has appeared on Today, The Doctors, Fox News, Access Hollywood, Hallmark's Home & Family, and many other syndicated shows. Her work has been featured in People, O (The Oprah Magazine), USA Today, Shape, Women's Health, Parents, and Fitness, among others, and she is a frequent contributor to Today.com. "In her signature trusted voice, Danielle Walker offers a new classic filled with expert tips and recipes that achieve glory while being entirely grain-free and Paleo. Even if, like me, this way of eating isn't a lifestyle for you, nothing feels like it's missing from these tried-and-true recipes. My body feels great, and my taste buds do, too. The pictures alone make you want to dive head first into her delicious world of abundance to celebrate all year long." "Danielle Walker is nothing short of inspiring. Rather than allow autoimmune disease and food limitations to sideline her, she instead tackled them head-on, creating an approach to food that's not only sustainable for her and her family, but also mouthwateringly delicious! Her new collection of special occasion recipes is a treasure trove for anyone---food sensitive or otherwise---who enjoys beautiful food." "In 125 recipes, Walker show cooks how to prepare holiday favorites while meeting paleo-style requirements, transforming them into something as treasured as any traditional dish." "Gluten- and dairy-free eaters, this is the fall cookbook for you. Walker shows you how to create delicious, comfort food classics—like Thanksgiving stuffing and vanilla birthday cupcakes—without using grains, dairy or gluten." "Danielle Walker has a grain-free, whole-foods based approach to cooking, and her Whole30 recipes have been longtime favorites of our community. 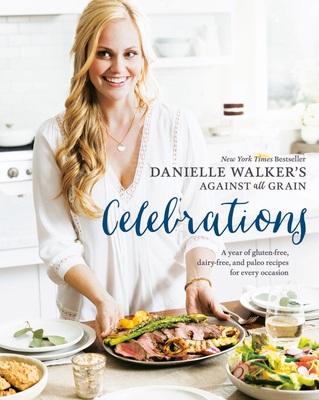 In her new cookbook Celebrations, Danielle provides grain-free, allergy-friendly recipes for celebrating life's milestones and special moments. This cookbook is the perfect compliment to support your food freedom in your life after Whole30, as you enjoy time spent around the table with family and friends." "Healthy options for holidays and special gatherings never tasted so good!"